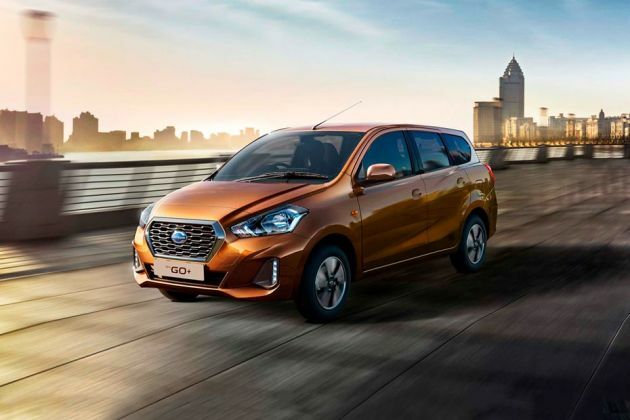 Nissan owned low cost car making company, Datsun accomplished the demand for the enthusiasts who had tremendous zeal to drive a big family vehicle at low budget. After taking a humble entry into the Indian market by its Go hatchback, the manufacturer has now rolled out the MPV version of this model. It comes in total of four variants and one of them is christened as Datsun Go Plus A EPS . Under the hood It is powered by a 1.2-litre petrol engine, which makes 67bhp. Along with the ground clearance of 170mm, this vehicle is pretty capable of tackling uneven Indian roads. The stretched out body design makes it quite spacious, where a total of 5 adults and 2 children can be accommodated easily or can carry a large amount of luggage by folding last two row seats. Apart from this, it come with a follow me home headlamps, speed sensitive electric power steering and gear shift guide. This trim gets civilized external appearance with chrome grille, wheel caps and body colored bumper. The designers have also applied decent furnishings inside with silver inserted closable AC vents, jacquard fabric and full moulded door trim. With all the above features it locks horns with the likes of Honda Mobilio and Maruti Ertiga in this segment. On the outside it has a decent design philosophy with numerous styling features, which includes bumper in an overall shade that is integrated to large air dam which takes care of cooling the engine. Just above this, there is a chrome treated black radiator grille that has a prominent Datsun emblem in its centre. Headlight clusters is fitted on both sides of this grille with halogen lamps and side turn indicators. Its front windscreen is equipped with speed sensitive wipers, comprising of drop wipe and intermittent functions. Taking a look on its rear profile, the door is painted in body color shade and is flanked by a pair of clear tail lamps. Moreover, this MPV includes passenger side outside mirror and 13 inch steel wheels, which are covered by 155/70 tubeless radials with caps. The materials used inside its cabin are good, but could have been better for the price it commands. Silver treatment is given on its three spoke steering wheel and closable air conditioning vents, while the seats are dressed with jacquard fabric. Besides this, it incorporates full moulded door trim, passenger side storage tray, door map pockets, driver side storage shelf and ticket holder. The seating arrangement is done up in a nice way with assist grips in the second rows, bench folding last row seat and front seat with sliding and reclining facility. Furthermore, integrated headrests are conferred in its first two rows for added support. This variant is engineered with a 1.2-litre in line petrol engine, making a maximum power of 67bhp at 5000 rpm and a peak torque of 104Nm at 4000rpm that are pretty ordinary for a seven seater. Based on a DOHC valve configuration, it includes a total of three cylinders and displaces of about 1198cc. An EGIS fuel supply system makes this car capable of returning a maximum mileage of 20.62 Kmpl, while minimum of 16.3 Kmpl. 158 Kmph of top speed can be attained after touching 100 Kmph from a standstill in 14.2 seconds. Despite being a budget friendly MPV, its front wheels are affixed with ventilated disc brakes in order to provide cooling and to cover up the paucities occurred due to drums fitted with rear ones. Its suspension is tuned perfectly to swallow any kind of bumps smartly, so that the occupants could have a comfortable driving experience. MacPherson struts are fitted to the front axle, while H type torsion beam comes at its rear end. Spilling the beans about comfy aspects, it leaves a good impact on the buyers with speed sensitive electric power steering, gear shift guide and remote fuel lid as well as tailgate opener. Other features include 12 Volt accessory power socket, AC with filter, heater and blower. It is blessed with follow me home headlamp feature, which stays on for certain minutes to show you the way to your door at night. Its drive computer shows digital tachometer, distance to empty, low fuel warning illumination, trip meter, electric fuel gauge, instantaneous and average fuel efficiency. The 48-litres of luggage room can be increased up to 347-litre by folding rear seat. From safety perspective, this vehicle is not quite impressive, but is good enough in keeping the occupants safe with adjustable seats, centrally mounted fuel tank and anti theft device. There are 3 point ELR seat belts in the first row, while third row comes with 2 point lap belt. It comprises of engine immobilizer to restrict any unwarranted entry. Moreover, the car maker offers headlamp leveling device, child safety rear door locks, front and side impact beams. 2. Fuel efficiency is quite good. 1. Airbags should have been added. 2. Only kids can be seated in third row.